The Trouble With Brighton’s Roads.. I travelled back to Brighton yesterday after taking a short break in Wales over Easter. To occupy myself on the train journey back I was, as usual, messing about on Twitter as a result of which I discovered that the main road along Brighton’s seafront had been closed. 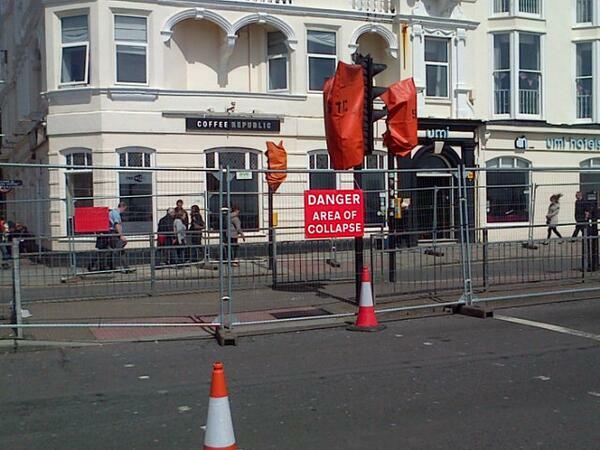 The reason for this – and the ensuing traffic chaos in the City Centre – was that the main A259 had partially collapsed. My heart sank at the thought of the problems I might have getting home from the station, but in fact by the time I got there – just after seven in the evening – the worst of the congestion seemed to have cleared and I got a bus home without any difficulty or delay. There isn’t actually a hole as such, just a couple of very wonky pavements either side of a section of road that’s in a very poor state of repair. In that respect it’s no different from most of Brighton’s streets. If you don’t know the area concerned, just at the bottom of West Street, you won’t know that this section of the A259 (King’s Road) runs above the a series of arched underground structures occupied by various shops and pubs. 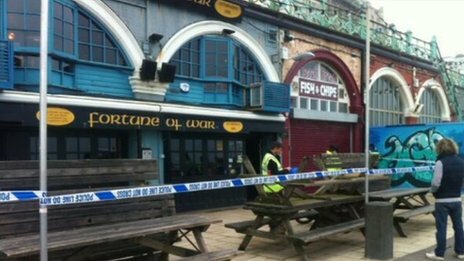 In fact the collapse happened inside a pub called the Fortune of War, when some workmen discovered several tons of rubble had fallen down from the roof above. Fortunately, no-one was hurt. 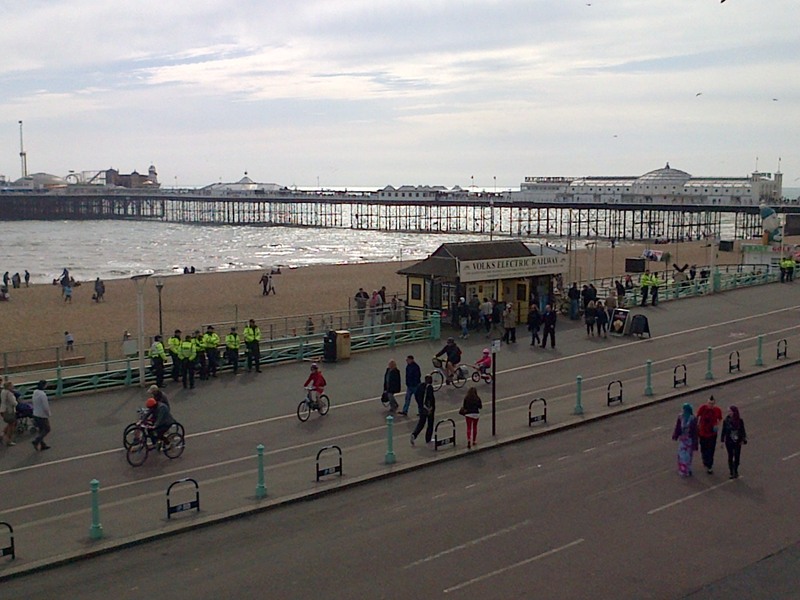 This is the view at beach level; the King’s Road runs above the pub, behind the iron railings at the top of the picture. One lane of the A259 is currently closed and a contraflow is in operation. Given that it is at the best of times a very busy road this, and the diversions that have been placed elsewhere to ease traffic on it, is set to cause congestion for some time to come, probably several weeks. The problem is obviously that the structures underneath the road were never designed to carry the weight of traffic that they are now expected to support. Brighton and Hove Council have been spending money on extensive roadworks elsewhere in the City but seem to have been reluctant to perform reinforcing work on this crucial route. There’s already a political row brewing about this. 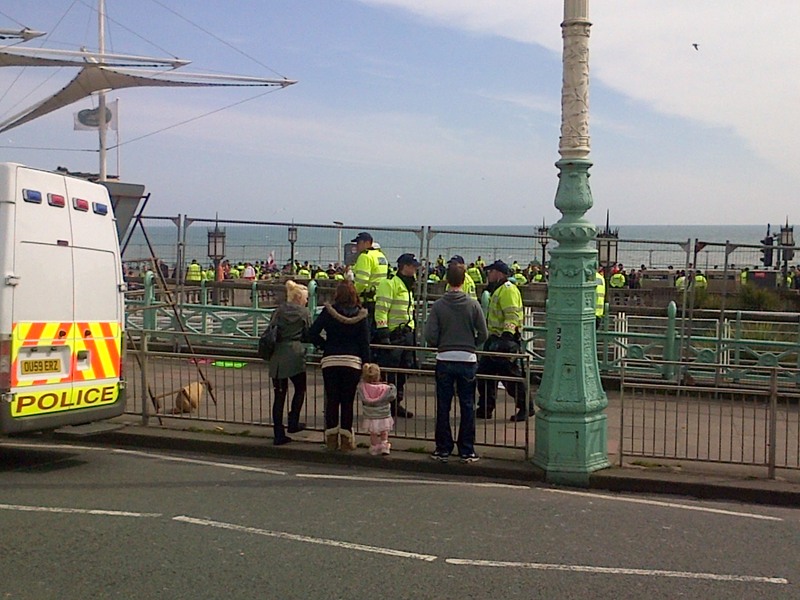 The barricades you see are nothing to do with with subsidence, but are there for tomorrow’s “March for England”, the annual attempt by the gang of Neo-Nazi thugs called the EDL to stir up trouble in Brighton. 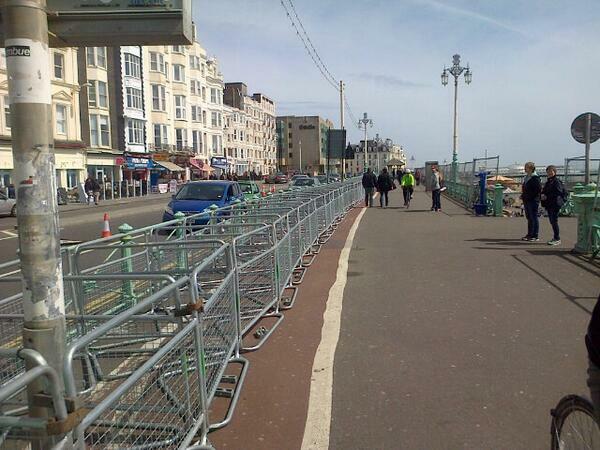 Presumably the fences are intended to separate the EDL from human beings. The collapsed road was to have been part of the route, but presumably alternative arrangements have been made. I would have preferred the road closure to have been used as an excuse to cancel the march altogether actually. I’d rather have no road at all than one filled with such creatures. 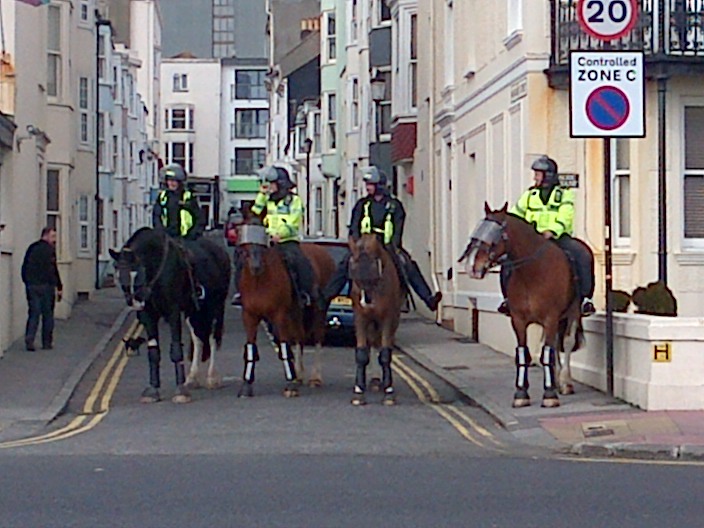 It has been a bit scary in Brighton today. The so-called March for England, took place this afternoon organized by the neo-Nazi English Defence League (no link to their website from me, you’ll observe). 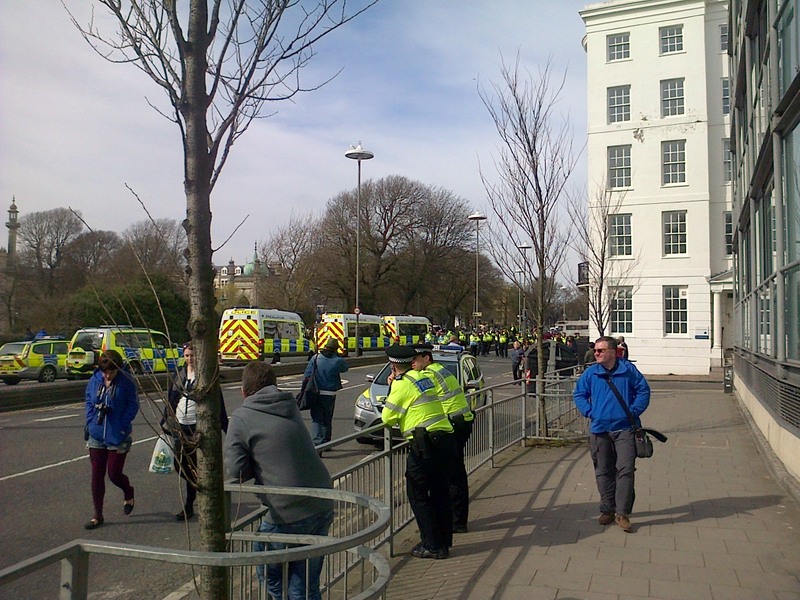 There was a massive police presence in town, at first concentrated on the seafront where the march was routed. There were localized brawls between marchers and counter-demonstrators from the outset, and after the march ended various splinter groups from both dispersed around the city trying to cause disruption. The town has been at a standstill since about 2.30 as police sealed off isolated disturbances and protected bystanders. 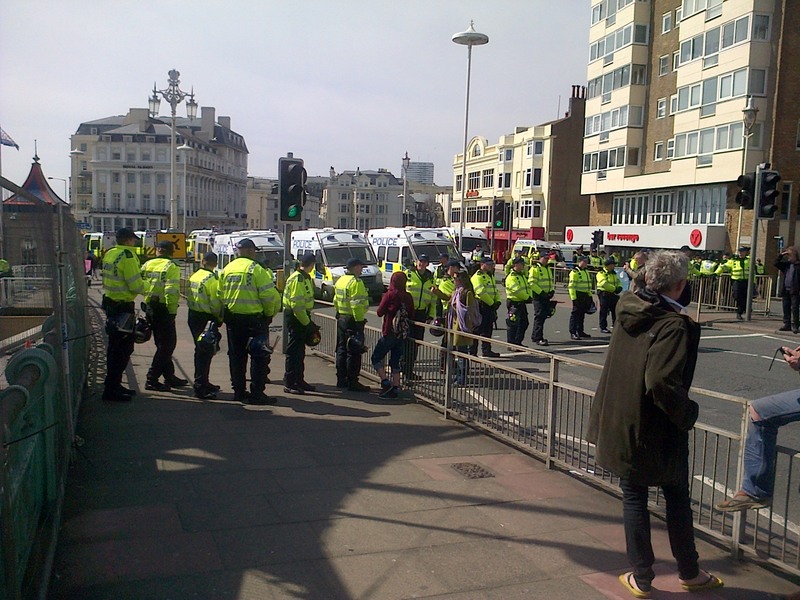 I was with a group of people near the Sea Life centre when half a dozen EDL thugs began hurling abuse and moving towards us in a very threatening way. The police intervened promptly and the agressors moved off. They may have subsequently joined a melee that then developed in the Old Steine and was attended by riot police but which did not last very long. The number of marchers was about 150 (my estimate) with a similar number of counter-demonstrators; they were probably outnumbered by the Police, who had brought in reinforcements from elsewhere to assist with Operation Wheeler, their name for today’s huge activity. I saw vans from Hertfordshire, Norfolk and the City of London. Anyway, with no serious injuries reported, I’d say Operation Wheeler was a success. I’ve heard that 13 arrests were made, for a variety of offences. I think the police did a very good job in extremely difficult circumstances. Why have this march in Brighton? I don’t know, but judging by what I heard, the typical EDL marcher is not very fond of gay people and they probably came here because of Brighton’s large gay community and embrace of other forms of diversity. Racism, homophobia and other forms of prejudice seem often to be acquired as a package. To be honest, I think the EDL just came looking for trouble and didn’t really care that much where it was to be found. Though the only violent acts I saw were carried out by EDL supporters there were extremists on the other side also spoiling for a fight. I think it would have been far more effective if the counter-protest had been totally peaceful. If thugs come looking for trouble, the worse thing to do is meet them at their level because that’s exactly what they want. The way to defeat people like the EDL is to behave better than they do which, based on today’s evidence, is by no means difficult..
You can’t see very well in this image, but in the background a group of EDL supporters are being detained by the police. These police horses are right next to “Legends”. There was a nice bit of banter going on between them and the largely gay clientele drinking out front. 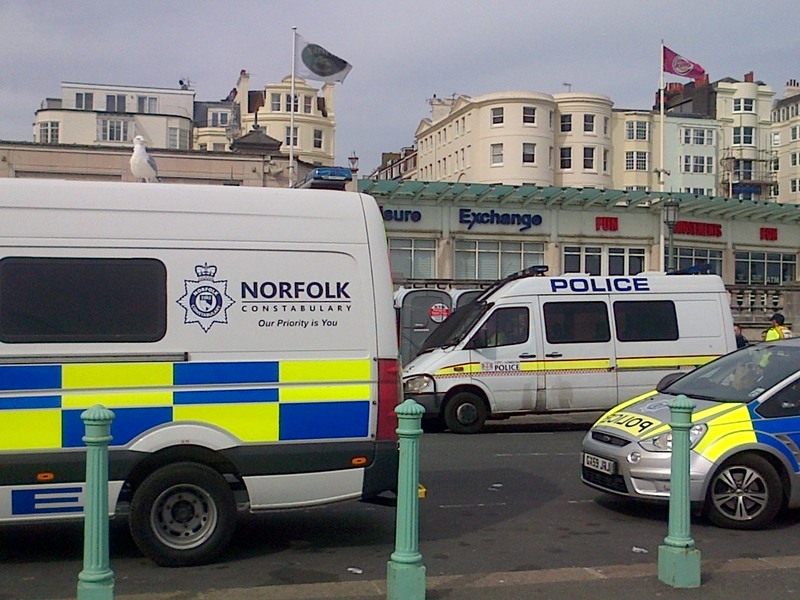 Police vans from Norfolk and the City of London. I can’t be sure, but I think the seagull was local. Old Steine, around 4pm. Ongoing disturbances in the background contained by police; nothing too serious by the look of it.